I am pleased to announce that I am hosting our Bread Bakers event this month. 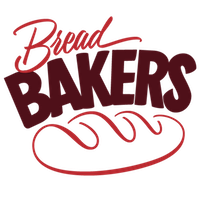 Of all the groups to which I belong, the Bread Bakers group is the one that takes me out of my comfort zone most often. I am very grateful to Stacy of Food Lust People Love for starting this group and for allowing me to be a part of it. 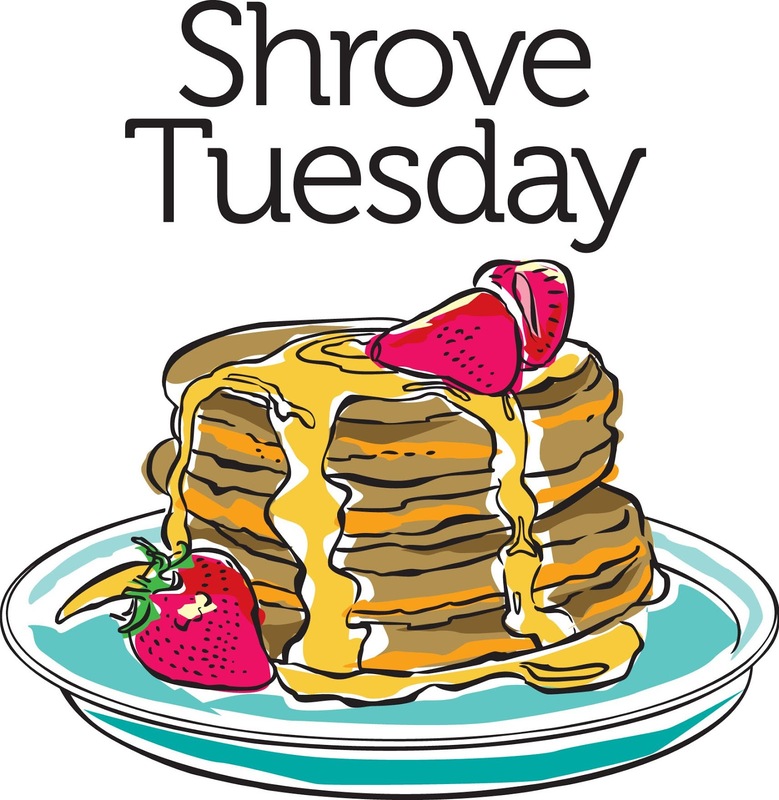 I asked to host this month because we celebrate National Pancake Week during the last week of February so I thought having pancakes as a theme would give our readers plenty of time to plan their own pancake celebration. 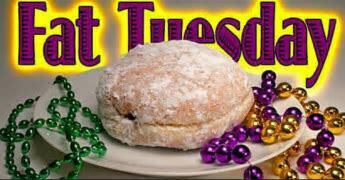 We are also sharing this post on Shrove Tuesday or Fat Tuesday as we call it. 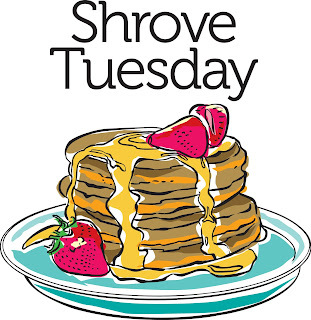 Shrove Tuesday is the day before Ash Wednesday, when Christians world wide begin 40 days of abstinence and fasting for the Lenten Season leading up to Easter Sunday. Tradition has us using up all of our flour, sugar, butter, eggs etc. to prepare ourselves for the fast. It is celebrated in different ways in different countries but there is always lots of feasting, fat eating and gorging. Whether you indulge in Pancakes or Paczki or both I hope that you enjoy your celebration and wish you peace as we prepare for our Lord's death and resurrection. 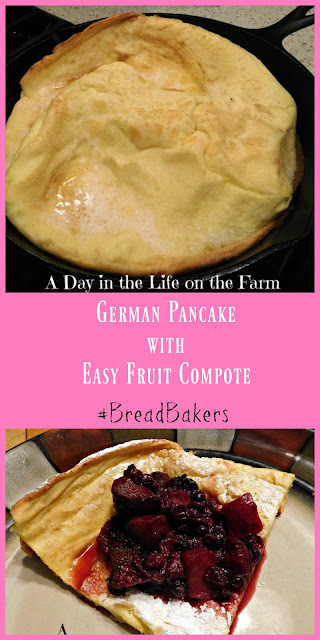 These German Pancakes, that I am sharing with you today, are perfect for National Pancake Week even if you are observing a Lenten Fast. They are not overly sweet and they can be filled with fresh fruit rather than the compote that I am sharing with you today. One pancake was plenty large enough for two adults and one toddler as today is also Toddler Tuesday in our household, or it would be if I were home. As you read this, we are enjoying our final day in sunny California, visiting my brother and his family. We leave to head home tomorrow morning. If you abstain from meat on Ash Wednesday, this would make a wonderful Valentine's Day breakfast to share with your love tomorrow morning. I'm really looking forward to everyone else's pancakes being shared today. We have pancakes from all over the world. You will find links at the bottom of this post. Place the eggs, flour, milk, salt and vanilla in a blender and blend until smooth. Set aside. Place the butter in a cast iron skillet and place it in the oven. Preheat oven to 400*. When oven is preheated, carefully remove skillet, using a potholder over the handle, and swirl the butter to coat the pan. Pour the batter into the hot skillet and return to the oven. Bake for about 15 minutes, until puffed and golden. While pancake is baking, place the fruit, sugar, water and cinnamon in a small skillet. Bring to a boil, reduce heat and simmer until slightly thickened. Transfer to a bowl and set aside. That's a perfect pancake for three! Love the fruit compote too. So easy. It was easy and delicious too. Dutch baby pancake is such a show stopper. Perfect breakfast treat and with all those berries, it looks delicious. Wendy, loved the write up. The pancakes are lovely and the fruit compote makes it look so delicious. Lovely looking pancake.... perfect for brunch on a Sunday with loads of fruits. Taste is what matters in the end anyway. Yes, I hope they give it a try. Perfect and filling breakfast pancakes, love the mixed fruit filling on top.